When rapid growth hits, that long-awaited success can make a lot of founders long for the days when they were merely struggling for product/market fit. There are new investors and board members to court, and RSUs, MAUs and CPUs to consider. And in the onslaught of pressing demands, it’s easy to hope that employee motivation is taken care of by the company’s success alone. Jack Chou is here with a PSA: Don’t do that. He’s speaking from experience. Chou has been on his fair share of high-flying startups as an early product leader for LinkedIn, the Head of Product for Pinterest, and now Affirm. He’s grown a team sevenfold in 18 months, helped shape brand-new technology, and taken business lines from $0 to major money makers. He understands the chaos. But he also knows that failing to make time to learn what makes people tick (and keep ticking) can mean the difference between thriving and fizzling out. 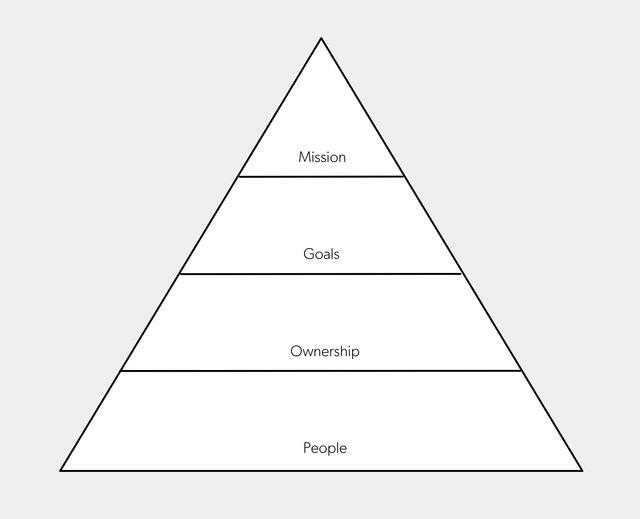 In this exclusive interview, Chou shares the pyramid he developed to explain how to build and maintain motivation—a new kind of hierarchy of needs that every startup founder and executive should internalize. He describes how leaders can spot flagging motivation in their day-to-day interactions, and offers tactics to start turning things around today. The first component of motivation is the team a person works with day in and day out. According to Chou, when team dynamics falter, it’s usually for one of two reasons. When heads are butting early in a partnership or team dynamic, Chou recommends giving it time. In many cases, people simply need to find their rhythm. “Maybe you should be in a room for two hours just whiteboarding this stuff out a little bit more so that you can build rapport. People need the time to get past formalities,” says Chou. Other times, you may encounter truly irreconcilable differences. Early in a leader’s career, there may be a temptation to let it go on too long, to believe that you’ll eventually solve the problem. Chou was disabused of that notion during his time as head of product at Pinterest, when he sat down with a product leader at one of the world’s largest companies. That veteran product leader did have a favorite trick for getting ahead of the issue: holding regular team hackathons to see which pairs naturally chose to work together. Once you’ve built teams that are sufficiently staffed and enjoy working together, they’re equipped to assume ownership for their work, the second component of motivation. Weiner stopped him. “He said, ‘What do you mean?’ So I said again, ‘We as a company are going to have sort it out.’ And he was just incredulous, asking, ‘Jack, do you think you’re demonstrating the proper sense of urgency right now?’ When I told him yes, he turned and asked every other person in the room whether each thought I was demonstrating the proper sense of urgency. Most of them said no. That really sears into your mind." Relinquishing ownership doesn’t always mean looking for another person to make decisions, though. Sometimes it means looking for other tools to replace their own judgement. An overreliance on testing is another crutch that Chou looks out for. There’s a place for that data, of course, and a time to wield experiments and A/B testing. But Chou encourages his teams to use testing to confirm a bet—not as another way to defer decision-making. Teach your team not to look to you for decisions all the time. That happens less through an explicit dialogue, and more across lots of small acts resisting the urge to make calls for them. Once people internalize a sense of ownership over their work, they’ll need clear goals to hone their intuition and sustain motivation. And the best goals are measurable, hard to achieve, and impactful to the business. One way to quickly set those goals is to agree on a set of target metrics: measurements of the project, team or company’s progress. But be careful. Metrics can quickly go from motivating to frustrating if they aren’t calibrated to the product’s lifecycle. The optimization phase, on the other hand, is where small gains can add up in meaningful ways. “That’s where we do think there are maybe hundreds of 1% opportunities, and if you add up all those it makes a really big difference,” says Chou. Once you understand where you are in the product lifecycle, metrics are a valuable tool for motivating and focusing a team. Chou frequently catches teams poring over metrics with no clear sense of what their target should be. Help them set the right goals, and you’ll also be guiding how they think about key business decisions. Goals, then, become a powerful way to offer guidance without compromising the team’s sense of ownership. By the time you get to the top of the motivation pyramid, if everything is going well, you should have a team forged by chemistry and ownership over their work, that is also driven by clear goals and metrics. Now, to achieve lasting motivation, you need to ensure that they also understand how that work benefits the company as a whole. Chou recommends two strategies: give teams the opportunity to share what they’re working on with the rest of the organization, and repeat your mission often (and in plenty of different mediums). People want their work to be about something more than just making money for a Delaware corporation. When you do spot the signs of flagging motivation, act quickly to diagnose the source and take action. Chou shared a few common failure modes he’s seen across roles and companies, and advice for how leaders can turn motivation around. 2. Your product managers are in execution mode, but no one feels like they have a stake in making decisions. Sometimes, a PM or team might be very close to their metrics — well versed in what they need to hit and why — but still feel like product decisions inevitably come from above. They quickly get stuck in a rut, either feeling sorry for themselves or simply falling into the habit of abdicating responsibility for their product plan. Pushing responsibility to someone who’s demonstrably unmotivated can yield a couple of benefits. For starters, you may get a good solution to a problem that needed solving. Perhaps more importantly, though, you get that person back in the game, personally invested in where things are going and how the team gets there. 3. Leadership has moved on to setting and pursuing big goals — but a team’s interpersonal dynamics are still rocky. “I think every leader has fallen prey to this one,” says Chou. The company is moving fast and you’re eager to start digging into those metrics and product roadmaps. But “people” is the bottom of the pyramid for a reason. Until you solve their fundamental challenge, you’re unlikely to really hit your stride. It’s easy to hypothesize what’s bothering someone. But until you ask, you’re unlikely to accurately diagnose what people really need. So simmer down your own opinions, ask open-ended questions, and then sit back and digest whatever you get back. The elements of motivation — people, ownership, metrics, and mission and purpose — are not only individual drivers that galvanize and energize teams, but all the more powerful when sequenced and stacked on each other. That’s why Chou visualizes these components as a pyramid, where chemistry between people is a precursor to a feeling of ownership, which is a prerequisite for effective measurement and metrics. For a motivation that brings employee longevity, teams must level up to an unwavering mission and purpose. All of these drivers become harder to reach and sustain as a company scales. That’s why Chou calls out two places were motivation can slip, as well as how to right the ship in common, tense scenarios. Photography by John Fedele/Blend Images/Getty Images.